Behind the scenes at the Dynaudio speaker factory | What Hi-Fi? How do you stand out in a crowded speaker market? Dynaudio thinks you do it by manufacturing pretty much every part of its speakers in-house at the company's HQ. We went to take a look. Much has changed for Danish speaker company Dynaudio over the last 12 months or so. A takeover by Goertek, a large Chinese electronics company, has resulted in fresh investment, an influx of new employees, and plenty of big plans for the future. But a key aspect of the company's DNA has remained the same: almost every part of its speakers are built in-house and assembled at the company's headquarters in Skanderborg, Denmark. A few hours' drive from Copenhagen, we visited to find out how the process works. Essential to any speaker is a magnet, so that's where we start. Without this, the electrical current flowing through the speaker wouldn't move the voice coil and driver, which produces the sound. Dynaudio takes care of all this on site. The drivers are magnetised in the factory by the machine pictured above. Dynaudio makes a wide range of drivers for a wide range of speakers - in-car audio is around 50 per cent of the company's business, requiring a whole host of driver shapes and sizes - so the company needs all the necessary magnets. Uniformity is key throughout the whole process, with everything from moisture to heat affecting the final sound. From the driver membranes to the voice coil, all the parts need to be the same for each speaker to ensure a consistent sound. Dynaudio is adamant that even the way the wires in the drivers are bent will affect the sound quality in a way that can be both measured and heard. And that uniformity extends to the diaphragms for the domes on the tweeters. Dynaudio is happy to use a sub-supplier in Germany to make the diaphragms - the company sees no advantage in making them itself - but they're built strictly to Dynaudio's designs. Above, the diaphragms are being coated by machine and checked for bubbles of air, or any other faults, by hand. The machine, unsurprisingly, is made specifically for this task, managing the amount of glue, where it's applied and so on, to create an airtight dome. The drivers are graded and the best ones go to the best Dynaudio products. This is just one of many tests carried out during the construction of each speaker, with each part added inevitably resulting in another thorough going over by a bleeping machine. Next it's time for the wires to be threaded through the drivers for connection to the terminals, a job that's done by hand and, we're reliably informed, is for women only: "No man can do this." We'll take Dynaudio's word for it. It certainly requires a precise hand. A small hole is poked from front to back and the wire passed through. Three months of training is supposedly required to perfect the process, one which we're again informed can easily lead to faults that can be measured and heard if carried out incorrectly. Of the 1.7 million drivers made every year, up to 1.5 million of them will be for use inside car audio systems as part of Dynaudio's deal with Volkswagen. With the new VW Passat including 12 Dynaudio speakers, it's easy to see how the numbers add up. As a result, Volkswagen has co-invested in some new, specially-designed robots for the factory, helping to speed-up the process of some tasks. Fancy one for yourself? It's one million euros per robot - and of course they're each only doing one part of the job. In-car speakers favour plastic baskets for the drivers, because they're better-suited for the various space, weight and temperature requirements. But for its home and professional speakers, Dynaudio favours aluminium baskets - for both visual and performance reasons, as the rigidity of the aluminium is better-suited to hi-fi performance. Conveniently, it's only a short stroll over the road to the factory where Dynaudio then marries the speaker parts with the cabinet. Everything larger than a bookshelf speaker is done here, with only the largest flagship speakers built on standalone mounting tables. Two more production lines are planned for "small, active wireless speakers", which Dynaudio expects to be producing a lot of some time soon... Watch this space. The wood is polished here and lacquer applied; with an impressive seven layers of lacquer for each speaker, and a fresh round of sanding and polishing in between. Up to 1000 speakers per week can be finished here. Once finished, the speakers are tested one final time. After that, they're ready to be shipped to a shop near you. Thorough? Just a bit. 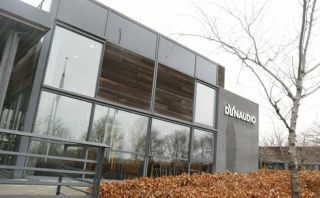 And this is only the half of it, with more and more space at the Skanderborg HQ dedicated to the R&D department as Dynaudio researches ways to keep ahead of the pack in the hi-fi, home, pro and in-car audio markets.